Marrakech is set to become an even more fashionable destination in 2017 with a new museum dedicated to Yves Saint Laurent's personal collection slated to open later this year in the Jardin Majorelle, one of Africa's most visited gardens. 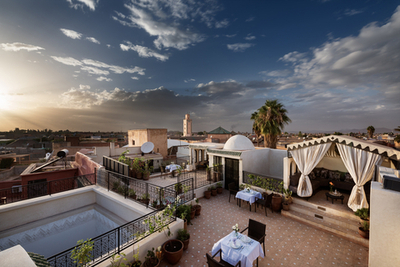 Stay in style and explore the wonders of Marrakech with a range of new packages from boutique portfolio, Marrakech Riad. Romantic Break, 3 nights from £175 per person per night – Enjoy a three-night break to one of the most evocative cities in the world, the colourful cultural melting-pot that is Marrakech. Just three hours' flight from the UK, Marrakech is the perfect romantic city break destination for a full-on sensory experience. The price includes three nights' accommodation at Riad Star, private arrival and departure transfers from Marrakech Airport, a romantic dinner on arrival overlooking the rooftops of the Red City, daily breakfast and a horse and carriage ride visiting the palaces and gardens of Marrakech. Culture Break, 3 nights from £175 per person per night – Marrakech offers a thousand years of culture only three hours from home. The price includes three nights' accommodation in one of the luxury Marrakech Riad properties, private arrival and departure transfers from Marrakech Airport, a traditional welcome meal on arrival, daily breakfast, a half day walking tour with a registered Marrakech guide and a half day tour by horse and carriage following the ramparts of the walled mediaeval city with stops at palaces and gardens. Taste of Marrakech, 3 nights, from £199 per person per night – For an authentic flavour of Morocco's vibrant Red City, book a Taste of Marrakech. The price includes three nights' accommodation at Riad Star, private arrival and departure transfers from Marrakech Airport, traditional Moroccan lamb tagine dinner on arrival, daily breakfast including local delicacies such as bissara (fava bean dip) and Khlear cured lamb, a private half day guided walking tour visiting the spice district, food markets, a bakery and traditional Meshwi lamb ovens as well as a half day cookery course in the new Riad Star demonstration kitchen. The package also includes complimentary mint tea throughout and a Clay Tagine dish to take home. Pamper Break, 3 nights, from £199 per person per night – Stay in one of the new Riad Star suites complete with meditation pods for the perfect rejuvenating retreat. The price includes three nights' accommodation at Riad Star, private arrival and departure transfers from Marrakech Airport, a delicious and healthy arrival evening dinner with seasonal Moroccan salads and local specialty, chicken-filled filo pastry parcels, daily breakfast, one hour private hammam – a signature Marrakech experience – followed by a half hour massage. Explore Marrakech, 5 nights, from £349 per person per night – Make the most of a trip to magical Marrakech with time to explore further afield. The price includes five nights' accommodation in one of the luxury Marrakech Riad properties, private arrival and departure transfers from Marrakech Airport, a traditional welcome meal on arrival, daily breakfast, a half day walking tour of Marrakech, a private excursion to visit the spectacular Ouzoud Waterfalls in the Atlas Mountains, a private day trip to the stunning port of Essaouira made famous by Bob Marley and Lawrence of Arabia and a horse and carriage tour of the Marrakech palaces and gardens. Packages can be booked at any of the Marrakech Riad properties subject to availability. Flights are not included; Regular flights are available from London Heathrow, London Gatwick, Luton and Stansted with Royal Air Maroc, BA, EasyJet and Ryanair (bookable direct). Flights are also available from Manchester and Bristol with EasyJet. About Marrakech Riad – The market leader for English speaking guests, Marrakech Riad consists of four traditional riad properties around the old town Medina, each with its own distinctive personality: Riad Star (featuring Dar Star), Riad Cinnamon, Riad Papillon, Dar Habiba. Each Riad has a dedicated, English speaking Moroccan staff offering a complete 24/7 concierge service. Guests can expect extras such as complimentary toiletries, breakfast served at the time of their choosing, help booking restaurants and excursions and if required, the loan of a local pay-as-you-go mobile to tap into the Moroccan hosts' local know-how while out exploring. Delicious three-course Moroccan dinners can be dished up on request. For more information, visit marrakech-riad.co.uk.